Tata Motors has the Harrier SUV as its next big launch in the domestic market during the early parts of 2019. The homegrown automaker officially unveiled the first model to be rolled out of production lines in Pune a few weeks ago along with exterior pictures. However, the interior images had largely been hidden under the curtain but not anymore. The premium SUV squaring off against Hyundai Creta and Jeep Compass is based on the H5X concept showcased at the 2018 Auto Expo and the road-going version does deliver on its promises by staying true to its concept. Based on the OMEGA (Optimal Modular Efficient Global Advanced) platform derived from Land Rover’s D8 architecture than underpins over a million SUVs worldwide, Tata has tested the Harrier for over 2.2 million km across different surface and weather conditions ensuring high ground clearance and water wading capability. 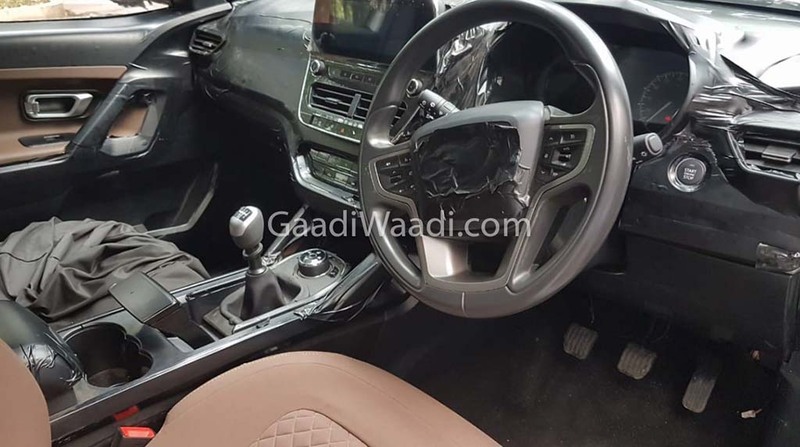 It will have multiple driving modes with rotary dial selection as in the Nexon and comes powered by a 2.0-litre Kryotec four-cylinder diesel engine that should be good enough to produce a maximum power output of 140 hp. It is connected to either a six-speed manual or a Hyundai-sourced torque converter AT. In the midst of its off-roading character with 2WD and 4WD configurations and a striking exterior with ample space on the inside, Tata has indeed concentrated on making the SUV highly premium. As evident from our spy shots, the cabin boasts upmarket design and features catering in-car connectivity and convenience. The Harrier can be bought in two-tone colour option with brown quilted seats and door side inserts. 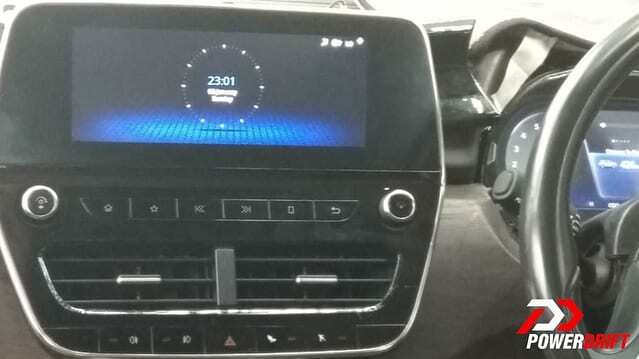 The obvious highlight is the large touchscreen Harman infotainment with Apple CarPlay and Android Auto connectivity with perhaps 8-speak audio. The dashboard comes fitted with a gloss finish on the centre console while the silver trim runs across the length of the dash on the lower section. The silver accents can also be found on the steering wheel with integrated controls, gear lever and along the centre stack. 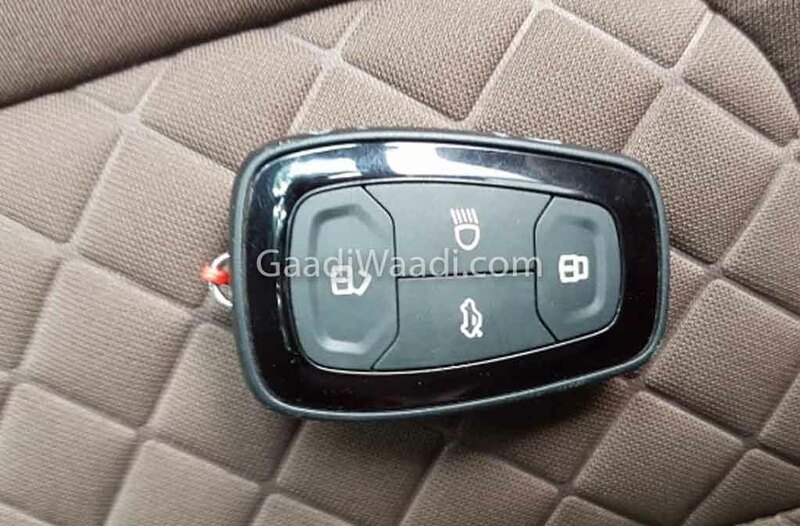 Behind the centre stack, the handbrake and cup holder section can be seen while the key fob indicates the presence of boot release button. 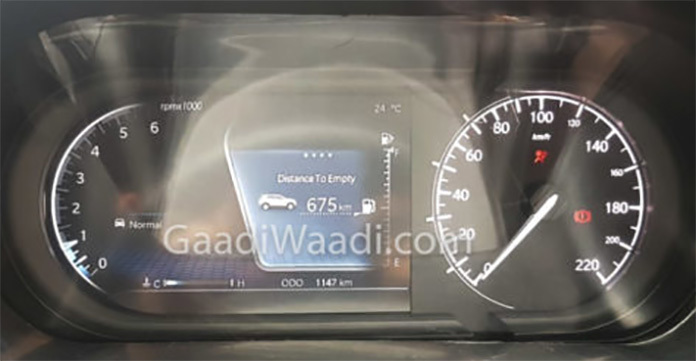 The instrument cluster boasts analogue speedometer and tachometer, slightly different from Hexa, while the multi-info display present in the middle has blue background.